Retract-a-Steps was invented in Penguin, Tasmania by an electrician who injured his knee by constantly jumping down from his vehicle. He figured there had to be a better way to get around his vehicle without risking injury. Since this early stage the potential for Retract-a-Steps and the advantage that it offers has helped the product grow. Initially only offered in 6 and 4 step, Retract-a-Step now offers dual handle options across the range as well as a removable Hook Step suitable for placing in loading docks and warehouse areas. Retract-a-Step has now seen its biggest change in its acquisition by Diver Consolidated Industries. Diver Consolidated Industries (DCI) is a well renowned engineering company in Melbourne that prides itself on been Australian owned and operated. specialising in metal stamping, robotic welding, powder coating and assembly, DCI are now looking to take the Retract-a-Steps product line into the future. 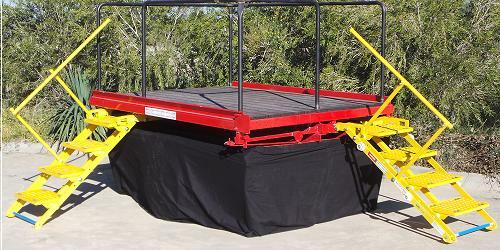 For DCI the Retract-a-Step product first came to light after a workplace incident involving a raised area on the back of a truck, and in searching for a safer alternative to using the standard rung ladder on the front of the bed the Retract-a-Step product was installed. Since then there has been no incidents or near misses at the DCI facility both on trucks with the product installed, and when using the Hook Step range on trucks that do not have the product. DCI manufacture the Retract-a-Step range in Melbourne Australia and distribute direct to the customer. All components and assemblies are Australian made and manufactured, ensuring quality and care. For further information about Retract-A-Steps, please Ask Us a question or Contact Us.